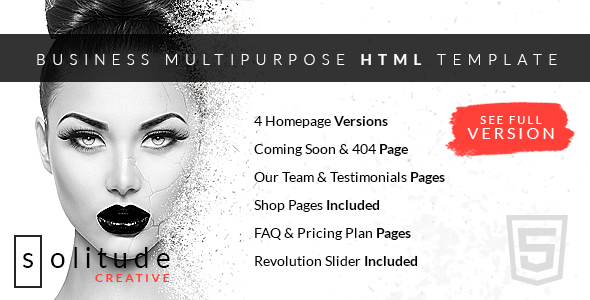 Solitude is a Powerful, Responsive and Raw Multi-Purpose and Multi-Page Template. Build whatever you like with this Template. Be it Business, Corporate, Portfolio, Agency, Magazine, Parallax, Wedding, Christmas, Media Agency, Blog or App Showcase, Shop simply everything is conceivable with Solitude . We have included 4+ Homepages prepared to-utilize and 45+ HTML Files with the Package, it is this immense. Stunning adaptability, Dark Scheme, Super Shortcodes, Raw Bootstrap and Scalable Responsive Features makes Solitude champion from the market. Experiment with the online demo.